We have music for all occasions, from house parties to weddings to corporate events. No job is too small or too big. We have been professionally serving Arizona since 2007 and insured. 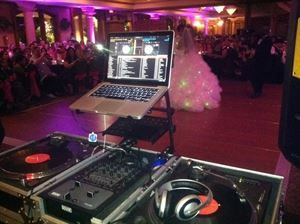 We are a family based business and DO NOT hire out any dj's. We DO NOT charge extra for set-up or tear down, basic lights, mileage within Maricopa County, or announcements. We have a signed contract and only require a $50 deposit to reserve your date. We always show up with a professional attitude and our main goal is to make sure that everyone is having a good time. We are also appropriately dressed for the type of occasion. We play music from the 50's to todays current hits, Hip-Hop, Rap, R&B, Old School, Pop, Rock, Classic Rock, Country and Top 40. We have a huge library of music and will sit down with you and work out the perfect list of songs to get your party ROCKING. Get your party started off the right way. We are very flexible to LAST MINUTE parties, so don't hesitate to drop us an email or give us a call. Thank you and hope to hear from you soon. DON'T MISS OUT, Call/text/email NOW, get a quote and reserve your date.